ABOVE: Celebrants keep the home fires burning at the Escalade in Geneva. Every year in early December, the Swiss city-canton of Geneva interrupts its pre-Christmas festivities for a different kind of celebration: l'Escalade, a festival that celebrates the city's victory over the Duke of Savoy's invading troops in 1602. The term escalade means "scaling" and refers to the Savoyards' use of ladders to storm the city's walls. The Genevois defended their turf with artillery, hand-to-hand weaponry, and the marmite of one M�re Royaume, who--according to legend--dispatched one enemy soldier and dispersed his companions by throwing her cauldron of hot vegetable soup at the troops who pushed their way up the street beneath her window. In honor of the redoubtable Mme. Royaume, Geneva's citizens sip cups of marmite while watching a three-hour torchlight parade of costumed re-enactment buffs fom the "Company of 1602" in Geneva's old town. The Escalade takes place from Friday through Sunday on the weekend closest to December 11, the day of the Savoyards' ill-fated invasion. 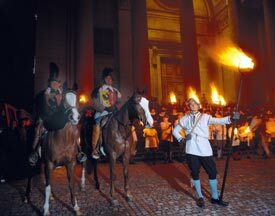 The parade begins on Sunday evening, when it winds through the old town and finishes near the cathedral. You can pick up an event schedule and parade map at the Geneva tourist office during your visit. Practice your French at this official site of the Escalade organizers. If you'd rather run than watch a parade, come a week early for the Course d'Escalade. Photo copyright � Switzerland Tourism.